Students research the geological processes of water with this unique kit developed by teacher Greg Johnson. The entire kit is contained in a heavy plastic storage box, 13 x 27 x 40 cm, which is used as the river basin. The kit is for grades seven through 10. 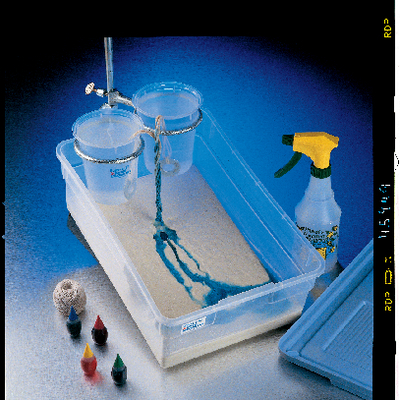 Ordering information: This kit includes diatomaceous earth, two beakers, a sprayer bottle, string, washers, food coloring, and a detailed teacher's guide with three labs and reproducible worksheets.